I had used Vista for a few months; even though I wasn’t satisfied with it I liked its eye candy interface and extra features like Vista DreamScene. Watching videos in the desktop background was a great experience. 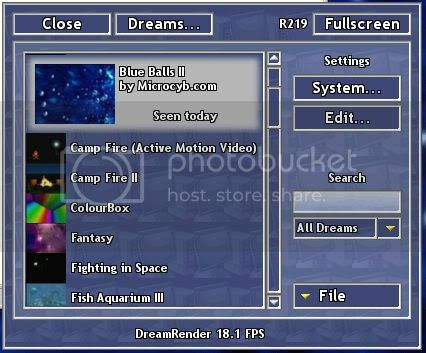 Well, if you’re wondering what’s DreamScene then it’s a feature in Vista which allows you to play an animation, clip or a video on your desktop background. In other short it replaces your boring desktop wallpaper with a clip, animation or a video. Unfortunately there’s no such feature in XP by default. But don’t get disappointed there’s a way to get it on XP using a software known as DreamRender. DreamRender is a free software which replaces your desktop wallpaper with stunning animations, and visual effects. You can choose from 1000’s of different effects using this software. The interesting part of this software is that it offers you a lot more than the Windows Dreamscene feature. Unlike Windows DreamScene, Dreamrender not only uses video as an animated desktop background, but also uses high end particle sequencing, 3D Object Animation, Custom Bubbles, Desktop Image Animations, etc. In addition to this, DreamScene is available in only one edition of Vista, i.e. Vista Ultimate. First download DreamRender from here and install it. Start the program; you’ll notice that a small icon appears in your taskbar. Right click on it and check the option “Enabled”. Having the check mark onto Enabled will allow you to see your DreamRender desktop animation. You can also select “Fullscreen” option; it will show your desktop without the taskbar or icons. Select “Settings” in order to configure settings. Now you need to create your own Dream or use one from the ones already available. If you want to create a new one click on File and select New. Now you can select the picture, video, etc you want to use as a background. You can also add various effects and change the size and other settings. Once done you can save the file and use it.